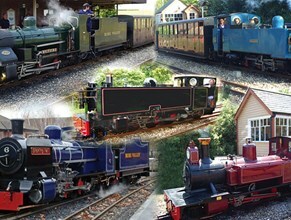 Whether you, a friend or a family member has a disability or uses a wheelchair, the Bure Valley Railway offers a fully accessible experience for a great day out. Both our Aylsham and Wroxham stations are all on one level, including shops, toilets, café, platforms and even the workshops at Aylsham. Perfect for wheelchair users or for those pushing buggies or prams. Along with our standard carriage fleet, there are six specially designed coaches which can carry wheelchairs easily. Each has a special seating arrangement plus double doors on both sides and detachable ramps. We can accommodate up to four manual wheelchairs securely. Other types of wheelchair may be carried depending on size. When a full three-train service is running, every train has two of these coaches, giving disabled passengers a completely free choice of which train to catch. Small electric scooters or wheelchairs can be accomodated within our accessible carriages provided they are not too large, or heavy and can be easily manoeuvred onboard a rail carriage without the help of railway staff to lift them into position. If travelling on the Train and Boat package, please call us on 01263 733858 to book as certain boats cannot accept electric scooters, or may need seats to be removed from the deck, prior to boarding.